My Home (bilingual picture book + activity book) – a highly recommended bilingual local context picture book and my blog’s very first giveaway! When I brought the book out for the reading pleasures of my older 2 kids aged 3 plus and 5 plus. My 5 year old quickly read the Chinese words to the best of his ability, sometimes looking at the hanyu pinyin for guidance. And of course the English words are simpler to him. So his 3 year old sister sat beside him and listened as he read both the Chinese and English. She was very attracted by the colourful illustrations and funny storyline. 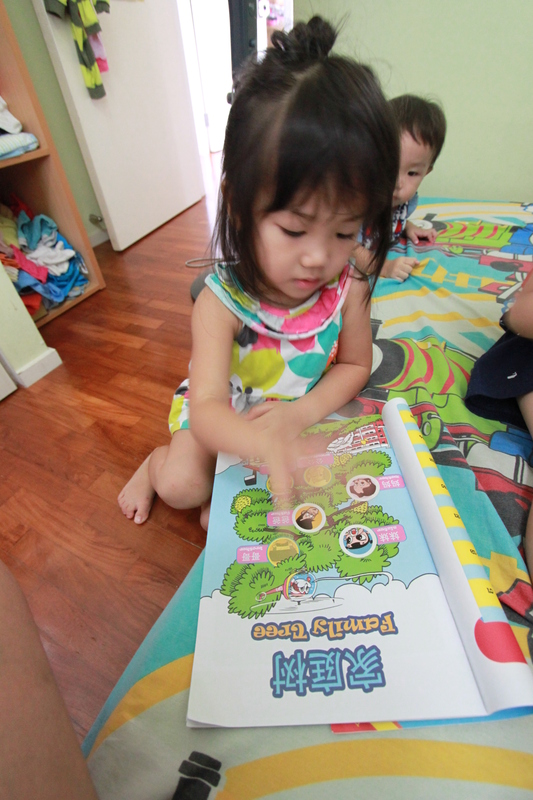 And the lift the flap feature will good to attract younger kids of ages 2 to 4 just like how much my kids love their Fisher Price lift the flap books! Just that the flaps are not as durable as the Fisher Price board books so I have keeping this book away from the hands of my 18 month old for now! 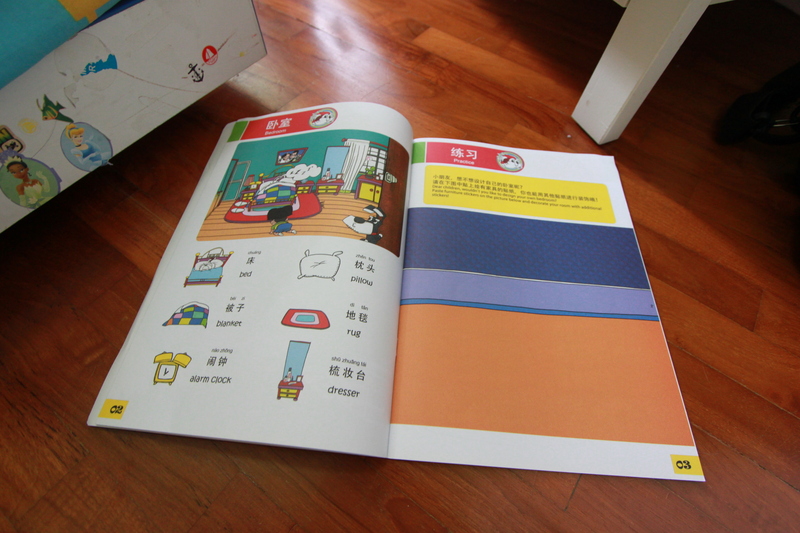 But it is not before long I will sit with my youngest to go through the book to give him introduction to Chinese. The story is narrated by Jason who is looking for a play mate and his little adventures or misadventures at home like stumbling into his father in the bathroom and when he entered the kitchen, he was tasked by his grandma to look for radish! And Jason goes beyond home to common facilities and surroundings found in the Singapore neighbourhood. This set came with “My Home” Activity Book. Which kids doesn’t like stickers, with the guidance of the brother, both completed the sticker based activity quite quickly. What I love what the pages showing the different sections in the home and the key items found in that section. It has both Chinese and English which was perfect for my girl who has started to show more interest in the Chinese language of late. So she was cooperative in dictating after me all the key items. The activity book even exposes the kids to the void deck, community centre, multi-storey car park which is very local and easily to relate to by kids growing up in Singapore. Even after the activities in the book are completed, the activity book is a keepsake a it is a mini English-Chinese dictionary for things found at home and in the community which is very useful for younger kids between 2 to 4 years old. For those who are interested in purchasing the books, the books can be bought separately. But it is much cheaper if it is bought as a bundle. 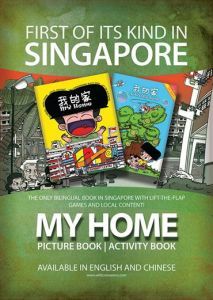 This book set is now available at MPH, Times, Kinokuniya, Booktique, Junior Page, Union Books, Maha Yuyi and Music Book Room. For those busy mums and online shopaholics like me, you can also shop online at Wild Crane Press. They are currently running a promotion to celebrate the launch of their new website, they are offering 10% storewide discount on all items purchased! You can also sign up as a member and today and enjoy a further 15% discount! At the same time do check out the other books are they carried. I am eyeing on the Wolf Series for my 5 year old boy! Wild Crane Press has kindly sponsored my first ever giveaway to officiate the launch of my own domain and my Facebook page. They have generously offered to give away THREE sets of the ‘My Home’ books to my readers! All you have to do is to follow the instructions in the Rafflecopter widget below.This giveaway is open to anyone with a Singapore address, and will end on Sunday , 7 December 2014, at 2359h. Winner will have to collect the book at their office. Disclaimer: We received this book set for purpose of this review. No monetary compensation was received, and all opinions are my own.